Levamisole is a synthetic broad-spectrum anthelmintic, which is active against adult and larval stages of gastrointestinal nematodes and lungworms in cattle, sheep, goats and pigs. After oral or parenteral administration, levamisole paralyses the worms. Levamisole is a synthetic broad-spectrum anthelmintic, which is active against adult and larval stages of gastrointestinal nematodes and lungworms in cattle, sheep, goats and pigs. After oral or parenteral administration, levamisole paralyses the worms. Afterwards the worms are expelled in the faeces (within 24 hours after parenteral administration). 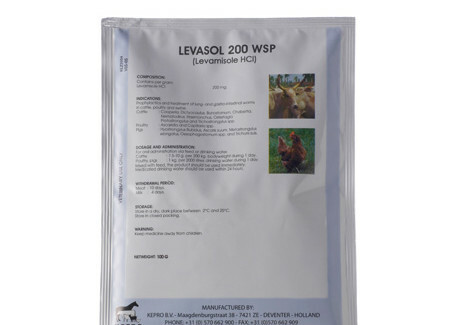 A therapeutic dose of Levasol 200 wsp is non-toxic. The product may be given to pregnant animals and to animals in poor condition. 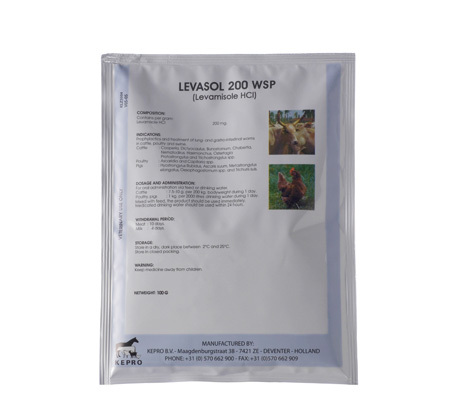 Levasol 200 wsp is indicated for prophylactic and therapeutic treatment of lung and gastrointestinal worms in cattle, sheep, goats, pigs and poultry. Poultry : Ascaridia and Capillaria spp. Do not administer to animals with an impaired liver function. Overdoses can cause colic spam, vomiting, hyperpnoea, excessive salivation, excitation, lachrymation, spasms, sweating and coughing. Do not administer together with morantel, pyrantel and organo-phosphorus compounds. For oral administration via feed or drinking water. Cattle : 7.5 – 10 g per 200 kg bodyweight during 1 day. Sheep, goats : 400 mg per 10 kg bodyweight during 1 day. Poultry, pigs : 1 kg per 2,000 litres of drinking water during 1 day. Mixed with feed, the product should be used immediately. Medicated drinking water should be used within 24 hours. Sachet of 100 g (120 sachets per box). PE-Pharma jar of 500 / 1,000 g (12 jars per box).